Mobile commerce provider P97 Networks, Inc. announced that they will launch a program to enable mobile commerce with Chase Pay to pay at the pump and make in-store purchases with their smart phones. Chase Pay is a simple, rewarding and secure payment service that enables merchants to accept consumer payments in-store, online and in app. 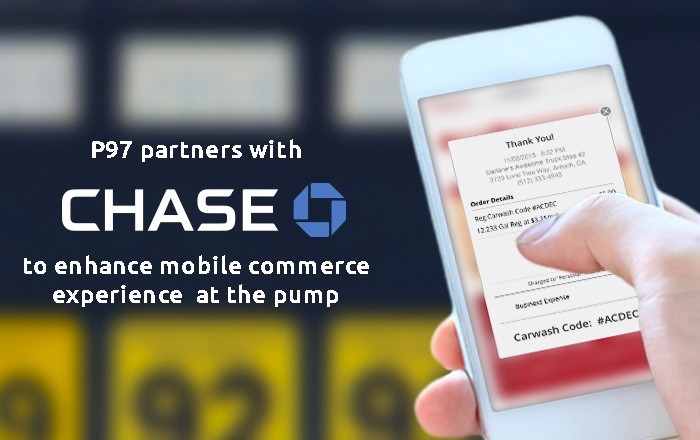 Chase’s strategic partnership with P97 will allow Chase Pay to seamlessly integrate with retail site systems through P97’s PetroZone® Mobile Commerce Platform, including mobile payment capabilities, digital marketing, loyalty programs, and customer reward systems. “Our technology partners, such as P97, are industry visionaries who will integrate Chase Pay into merchants’ overall payment acceptance strategy,” said Tom Nipper, executive director of Global Enterprise Solutions for Chase Commerce Solutions. As the payments industry increasingly shifts from plastic to digital, Chase is leveraging new partnerships and technology to advance the consumer digital experience. With P97’s PetroZone® mobile commerce platform integrated to existing gas station infrastructure, Chase customers will be able to search for and navigate to the nearest gas station, make mobile payments at the pump and pay for merchandise with their mobile phones.